That quote reflects author Nikita Gill’s thoughts on memories of those who have passed away. Memories matter. 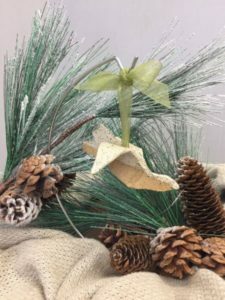 Now you have a chance to visualize the memory of a loved one through the Hospice of North Ottawa Community Tree of Life. Our 2018 Tree of Life will be prominently displayed in the window of the Tri-Cities Museum from November 1 to through December. This year, we have engaged artisans from the Holland Arts Council to handcraft beautiful clay doves. Each dove is one of a kind…just like the people whose memories are being honored. We invite you to give a gift to North Ottawa Community Hospice in memory of your loved one(s). We will inscribe a label for each name, and affix it to one of these graceful doves. They will decorate the Tree of Life from November 1 through the end of December, reminding you and all those who pass by of the love you hold for those who are no longer with us. A letter will be sent to each honoree or their family members(s) indicating a gift has been made from you. The amount of the gift will not be disclosed. If you would like your commemorative dove sent to you after the holidays, simply complete the form as indicated. Please contact Connie Frazier at 616.847.5605 if you have any questions or would like to purchase a dove. Your gift is a tangible tribute to those you have loved and lost. It is also an unspeakably beautiful gift to those who are in need of the care and comfort that hospice provides at the end of life. We, and all those who experience the thoughtful care of hospice, thank you for your gift. We wish you a holiday season filled with peace and beautiful memories.